The Union victory over Confederate forces at the Battle of Gettysburg (July 1-3, 1863) is considered a major turning point in the Civil War. But it was also the costliest in terms of human lives—more than 51,000, nearly one-third of all forces engaged, were killed, reported missing, or wounded. Soon after, a project to build a cemetery for the Union dead began. Two men spoke at the dedication of the Gettysburg National Cemetery on November 19, 1863. Edward Everett, a well-known orator, delivered a two-hour speech. 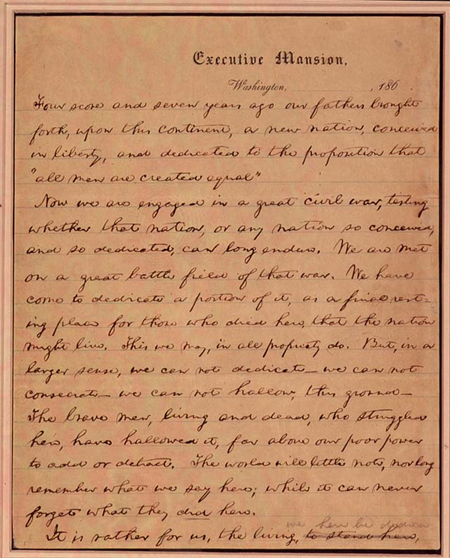 President Abraham Lincoln’s speech—known today as the Gettysburg Address—lasted only a few minutes. Primary sources can help students better understand the power and significance of this historic speech. Below you will find all the resources you need to implement this activity as well as links to related content and activities.